Social media is adult swim and it is so easily accessible and desirable to youth. At very early ages, children are eager to engage the screen and while supervised with child apps, it is possible to maintain a measure of control over what their on-line experience delivers. As children grow older and mature, so do their expectations for on-line experiences. Platforms like SnapChat and Instagram surface as “digital hangouts” and expose kids to in appropriate content and bullying. The apps will continue to innovate and new ones will surface. 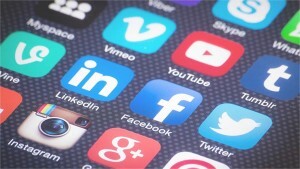 (See the CBS News list of the top 16 most popular apps according to a survey of the class of 2015). So the concern from the parent’s point of view, is not trying to keep track of all the possible apps your child may want to use, but to maintain an open dialogue about their interests and build trust about what apps they are allowed to use, when and why. Social media is a very compelling experience, and in their pursuit to seek personal identity and sense of belonging, children at earlier ages can come to believe that in order to be a real person, to be visible, they must have an on-line presence. Most social media platforms have a minimum age of 13, because there is a level of social maturity required to engage in and manage a network of contacts. Some of the social media platforms, like Tinder, are explicit and have an older age requirement of 17 or 18. So it is important to check it out, because these things can change. Early on, get in the habit of reviewing the age requirements and be very circumspect with your permission about allowing use. For example, if your child is 10 years old and wants to have an Instagram account, and the minimum age is 13, then you will want to be clear about your reasons for honoring or not honoring that rule. A reason for honoring the minimum age rule is to reinforce that the answer is not “no”, it is simply “not now” – and furthermore they must learn how and when they will become eligible. It is more than knowing how to use the technology. In the meantime, help them engage in other age-appropriate apps (check out Common Sense Media). In this regard, your role as the parent is to become the trusted resource for the wisdom every child wants and needs to know about their own personal power. Below are some tips for engaging your child in conversation about their desire to have an on-line presence in the social network and how to guide them to accomplish this in a secure and responsible way. Acknowledge the desire for an on-line presence. Acknowledge to your child that their desire is normal, and you understand. Express your commitment to help them achieve their goals in ways that empower them, and teach them how to avoid getting duped or harmed by bullies. Discuss the implications of maintaining an on-line presence. Explain to your child that establishing an on-line presence is not just about creating a profile. That part is easy. Having an on-line presence requires you to know yourself; to have a strong sense of identity when responding to the things other people say and do on-line. There is a level of maturity involved such that when your child can have a conversation with you about your family values and their personal values, this is one of the criteria that qualifies a person to be ready to represent him or herself in the social network. Ask your child to think about how they want to show up in their peer group and in the world? Like a leader or a follower? A leader will not give up personal power to the bully, the drug or the device. This means that you have rules and boundaries to live by. And so, the next thing to talk about is the boundaries that your child chooses to govern their on-line experience. All apps must be “approved” before downloading. The reasons have to do with personal security for your child and your family. The idea is to be aware of malware and also to have a conversation about how this app will make your life better and possibly create new challenges. Standards for on-line conduct are associated with your family values. Your values are tied to those aspects of being a trustworthy person (sibling, friend, etc.). Everything your child does and says on line should be able to withstand the light of day; there can be no secrets. If there is a temptation to keep a secret then that is a sign that something is wrong and there is risk involved. There is no privacy on-line. You are the guardian of their privacy. This means that while you will be monitoring all cyber communications, you nevertheless respect their privacy, by not blabbing their personal business to others and commenting on everything you see. Observe but do not insert yourself into your child’s cyber social realm. Build trust on and off-line. It is their network that they are learning to develop and nature; your job is to be the trusted resource for imparting wisdom operating like a utility in the background. If you witness something that requires attention or correction (such as gossip, bullying or inappropriate photos), then talk about it off-line. Encourage your child to think about how the communications and posts reflect your family values and their own values. Remind your child that the ultimate aim of engaging in a social network is to build trust over time, so that there can be a measure of peace and productivity in the peer community. The characteristics of trustworthy individuals can be found in the description of love in 1 Corinthians 13:4-8. 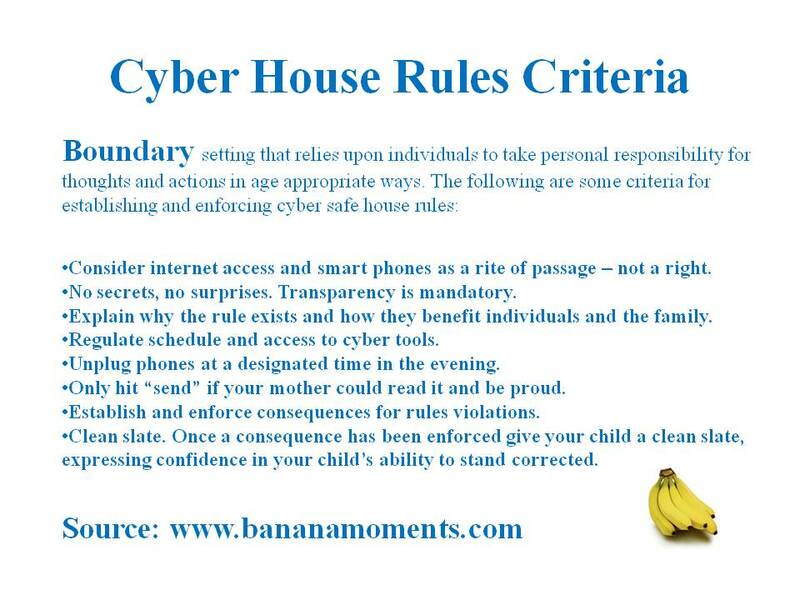 Posted in Boundaries, Bullying, Children & Teens Problems & Pitfalls, Children's Health & Mental Health, Cyber Safety, Cyberbullying, Faith, Mobile Phone Use and Children, Parent-child communication, Parental control, Parenting, Privacy, Relationship, Sexting, Social Media, Teenagers, Texting, The Fish 103.9FM Cyber Tues, Wisdom.